Chris Duane has done it again. 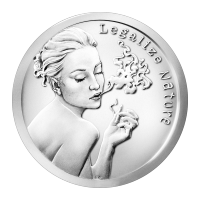 The obverse of the latest round in the Silver Shield collection features a glamorous woman, in the vein of a 1930's starlet, exhaling smoke with her eyes closed. The idea behind the round is that cannabis is as big a threat to the status quo as silver and sound money are. The reverse features the Silver Shield logo with the trivium in the centre encircled by the words "Silver Shield 1 Troy Ounce 2015 999 Pure AG" surrounded by 47 bullets. The 47 bullets refer to the atomic number of silver. This limited mintage round was only in production for three months. 1盎司2015年人性无罪银圆 Chris Duane has done it again. The obverse of the latest round in the Silver Shield collection features a glamorous woman, in the vein of a 1930's starlet, exhaling smoke with her eyes closed. The idea behind the round is that cannabis is as big a threat to the status quo as silver and sound money are. The reverse features the Silver Shield logo with the trivium in the centre encircled by the words "Silver Shield 1 Troy Ounce 2015 999 Pure AG" surrounded by 47 bullets. The 47 bullets refer to the atomic number of silver. This limited mintage round was only in production for three months.